This book examines recent trends in global student mobility but will also explore how this mobility has impacted lives of both local students and their international counterparts in Africa, Asia, Australia, Europe, Latin America, Middle East, and North America where the emerging trends and practices are prominent. Today, over five million students cross geographic, cultural, and educational borders in pursuit of higher education. Higher Education in Nepal: Policies and Perspectives (Routledge, New York). This book aims to present a showcase of Nepalese higher education with critical perspectives on topics related to the impacts of local sociopolitical changes and global forces on public and private education, emerging online and distance education, administrative and intellectual leadership, quality assessment, graduate employability, global mobility of students, and the causes and impacts of global diaspora of Nepalese scholars. The central questions of the book are: What issues and perspectives can research and scholarship about Nepal’s higher education offer to international discourse in higher education? What are some of the local and global academic interactions in Nepalese higher education and what are the current challenges and pathways for advancements and improvements? How can Nepalese higher education absorb 21st-century values of quality education while adapting new developments to local needs? How can scholars interested in Nepalese, South-Asian, and international higher education create opportunities for scholarship and professional collaboration around research on higher education in this region of South Asia? This book offers information and resources to international educators interested in the dynamics of Nepalese as well as South Asian higher education by introducing the key challenges in policy and programs, innovative changes in curricula, effective approaches in technology application, and strategies for future integration of global reforms in education. Global Perspectives on International Student Experiences in Higher Education: Tensions and IssuesPublisher- Routledge (Taylor & Francis, USA). This book is an empirical attempt to document a myriad of international student experience from multiple perspectives that includes socio-cultural identities, contextual influences on their learning experiences, their wellbeing experiences, and their post-study experiences. This book consists of 19 chapters spread across four sections. The contributors of this volume bring many years of experience teaching and mentoring teaching international and domestic students. International Student Mobility and Opportunities for Growth in the Global Marketplace(This book presents the emerging challenges and critical perspectives cross-border mobility issues, international student challenges, recruitment initiatives, and importance of cross-cultural competency and global perspectives. 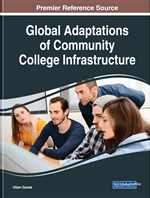 Global Adaptations of Community College Infrastructure --This book will provide various contextual adaptations of the idea of American Community College as a connective solution to engaging community and industry so that any nation or state can forge policies on adapting the concept toward democratization of economic opportunities to their young men and women as opposed to the current elitist system of higher education. “This book is very timely and provides a comprehensive overview of various aspects of international student mobility. The editors should be congratulated on successfully bringing together the expertise of a wide range of authors from across the world.”– Divya Jindal-Snape, PhD, Professor of Education and Associate Dean, University of Dundee (Scotland), author of Multi-dimensional Transitions of International Students to Higher Education(2016) and Educational Transitions: Moving Stories from Around the World(2013). “An extraordinary resource for anyone working with international students. Filled with detailed chapters from the leading practitioners in the field.” —Charles Lipson, University of Chicago (US), Author of Succeeding as an International Student in the United States and Canada and Doing Honest Work in College.